The 4K Ultra HD revolution has left the star-studded homes of the video elite and landed in Everytown, USA. Now, just about anyone can get a TV equipped not only with 4K Ultra HD resolution, but also high dynamic range (HDR) for enhanced contrast and color shading. The best news is, you don’t even have to compromise on screen size anymore to save a buck — you can now get new, large-and-in-charge ambassador of epic imaging without emptying your savings. While it’s true that 4K content hasn’t kept pace with the hardware, it’s now coming in from multiple directions, and the latest TVs also boast better future-proofing, the latest processing and motion technologies, and more. 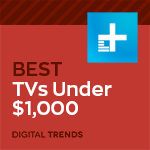 Follow along below for a close look at the very best TVs under $1,000. Why you should buy this: It’s the only way you’ll get a 65-inch screen for anywhere near $1,000. Who it’s for: Anyone looking for a big screen on a budget. Yes, we know this TV fluctuates above the $1,000 line from time to time (though at the time of publication, it could be nabbed for less than that number), but this one is worth it. TCL has been making great strides in recent years, and its 6-Series Roku TVs show just how far the company has come. If you’re looking for a 65-inch TV for around $1,000, this is your best bet, and you won’t be skimping on features or performance to get that extra size. This TV features both HDR10 and Dolby Vision HDR formats, as well as support for Wide Color Gamut for increased color accuracy and vibrancy, and 120 individual local dimming zones to allow for impressively deep blacks and excellent contrast. The 6-series also has impressive smarts thanks to the integrated Roku platform, which provides all the features of a standalone Roku baked right into the interface. You can even pause live TV when you’re using an HD antenna. Despite only being released in May, this TV is already incredibly affordable, and the price will only come down moving forward. Why you should buy this: This TV packs the best picture quality in its price range. Who it’s for: Anyone willing to swap sheer size for a better-looking picture. This TV offers arguably the best picture quality for the price, mainly thanks to Sony’s top-notch processing. The X900F series boasts fantastic black levels, brilliant colors, and eye-popping brightness thanks to impressive HDR technology that includes support for HDR10, Dolby Vision, and Hybrid Log Gamma, a relatively new kid on the block intended for broadcast TV. The X900F runs on Google’s Android TV platform, which not only means you get Chromecast built in to beam a massive variety of content from your phone or tablet, but you can also easily buy and rent movies from Google Play Movies & TV and watch them in all of their 4K HDR glory. You’ll also have onboard access to a ton of services like Netflix, YouTube, and others for even more shows and movies. Plus, the TV packs in both Google Assistant and Amazon Alexa for all the voice control you could possibly want. Currently, the 49-inch model may be the closest to $1,000, but even the 55-inch model could go for less than that in the near future. Why you should buy this: It’s the brightest TV on this list and it happens to look fantastic as well. Who it’s for: Anyone who often watches a lot of daytime TV or just wants a cool design. While it might not offer the spectacle of Samsung’s 2018 QLED lineup, the NU8000 is still plenty impressive and will cost you far less. The TV combines excellent brightness, deep black levels, and quality HDR for a great picture no matter the lighting. You won’t find Dolby Vision here, but you do get the open-standard HDR formats HDR10 and HDR10+, which are widely supported. The TV also runs on Samsung’s Tizen OS interface, which is among the best platforms in TV land. Samsung’s TVs also have some handy features for everyday use, including the ability to recognize just about any HDMI inputs you plug into them, label them on the screen, and automatically set up your remote to control them for serious convenience as you move through content sources. Speaking of the remote, it’s the same One Remote you’ll find bundled with Samsung’s QLED models. The NU8000 is a steal of a deal that will bring your TV-viewing habits into the future. Why you should buy this: It offers some of the best 4K HDR real estate on the market when it comes to performance for the price. Who it’s for: Those looking for a fantastic picture at a great price. One of the best values in TV land, Vizio’s latest P-Series TVs have a new design both inside and out, starting with a three-sided, bezel-less frame. Inside, the P-Series is loaded with some of Vizio’s best processing tech, including Xtreme Black Engine Pro local dimming, alongside impressive HDR10 and Dolby Vision HDR performance powered by a full-array LED display. The result is spectacular contrast in the brightest and darkest moments, rich and natural color, and an impressively uniform screen. The P-Series simply offers some of the best picture quality available at its price and, in a triumphant return, a TV tuner so you can connect your HD antenna for free local channels. While we’re not wild about Vizio’s somewhat sluggish Smartcast interface when compared to TCL’s 6-Series TVs, it does offer multiple ways to stream just about anything you want, and better performance to boot.